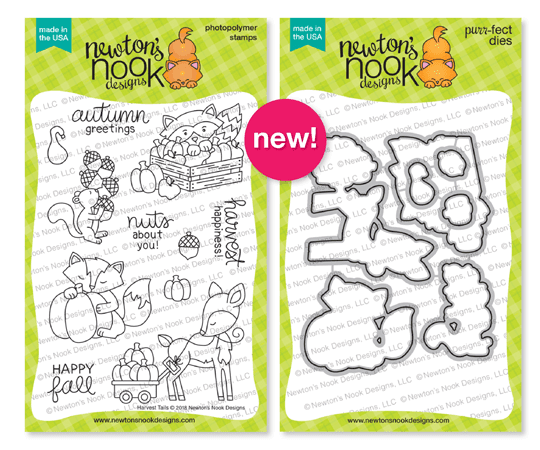 Hi everyone and welcome to Day 3 of the September release at Newton's Nook Designs! Today I've got an amazingly adorable critter stamp/die set to show you, Harvest Tails! I absolutely fell in love with this sweet little deer pulling a wagon full of pumpkins. 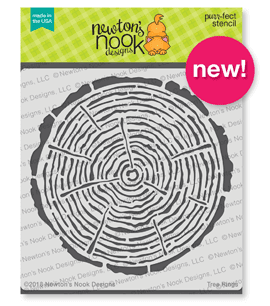 And oh, I need to just tell you that I jumped for joy when I saw this AMAZING Tree Ring Stencil!! I took a piece of kraft cardstock cut slightly smaller than my A2 sized card. I distress inked the inner part of the ring in Tea Die Ranger Distress Ink and then did the outer ring in Walnut Stain. I copic colored my little deer and pumpkins, (and leaves from the Newton's Cornucopia stamp set revealed on Day 1), then assembled my scene over the tree ring. I did a little white splatter over the ring. I guess it sort of looks like snow, which is very common around Thanksgiving in some climates! I added a double banner at the bottom, from the Flags and Frames die set! Thanks for stopping by and make sure to comment on all the DT's blogs for your chance to WIN this stamp set! Love your card. I need that stencil. And the little deer is just so darn cute. Love your card! Thanks for the chance to win and sharing. I do not own any newton stamps yet however after seeing these new release samples I will definitely be purchasing. New Newton fan! Love this card. The deer is my favorite! I love how you did the snow and the background! Great card and stamp set! I think this stamp set is my favorite and the deer pulling the wagon of pumpkins is just adorable! I love your card with the tree ring background. Thanks for the wonderful inspiration to use this set. Love the piece of log for the background. Great fall card, love the design. I need to use stencils more in my cards, they are great backgrounds! Fabulous card! Love the Tree Ring background and the adorable deer! Pretty coloring on this beautiful fall card! Such a delightful card! Your splatters look terrific and I love how you arranged the images. Thanks for the inspiration . Beautiful card! Wow, love that tree stencil and the stamp set is adorable!!! Loved your card composition & colors, makes me smell Fall in the air! Love how you've incorporated that wood stencil for your background. Very nice. Super cute and creative. Thanks for sharing this with us all. Cute card. I love fall stuff and every year the products just get better and better! Love the stencil!! Very versatile!!! Also, love your card! Of course I would LOVE to win the Harvest Tails stamp set! Like all above I love the Log stencil and what you crafted with it! nice to meet you and follow your work all over the place! I look forward to your future shares! So awesome with the tree ring background. Brilliant use of the stencil and the white splatter is a nice touch. Adorable card! I really love the tree ring in the background! Really cool looking! And your coloring is so fantastic too! I also like the specks of white everywhere too! Very cool looking! This card is so fun & cute! Love the stenciled tree ring background & that adorable deer! NN makes the best stencils - love the new tree ring, and that deer- just darling. Absolutley love your card! Charming card! The tree ring background is cool, and the deer is delightful. Wonderful coloring and design. Oh my!!! It's too cute!!! Beautiful fall card! I love the stenciled background and the rich colors you used. I definitely love this new set! Sweet card. I love the deer and your wonderful background. What a pretty card. Great use of the stencil. Fabulous card! I love the tree rings stencil! What a super lovely card you made !! You’re right, that tree ring is so cool ! And I love how you colored the deer.